Aaahh, Fall dresses. How I love them. I love them because they’re right in my wheelhouse. 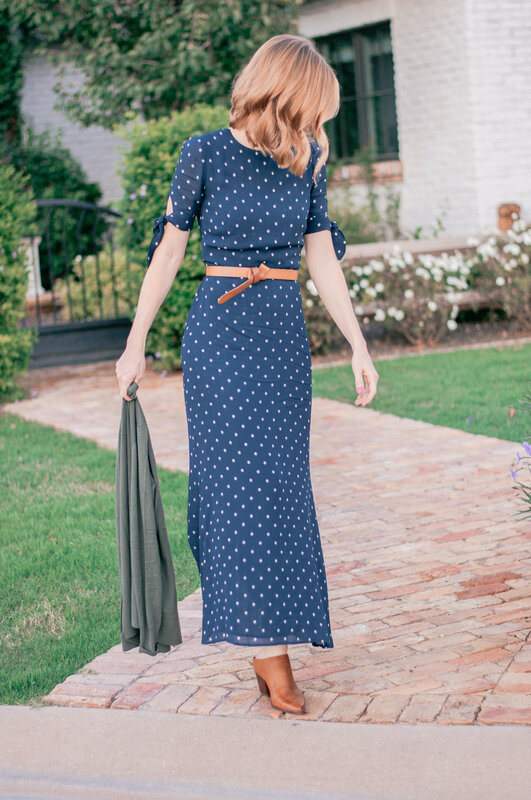 They typically don’t require showing as much skin as a summer dress, they showcase everything we love about the Fall color palette and because chilly weather layering is always acceptable in this season, every Fall dress can pull triple duty from Fall wedding guest to Fall work outfit to Fall casual wear and beyond. The kind of versatility I don’t always get out of a summer dress and the kind of versatility that you know I require in every one of my garments. And function aside, the fashion, the style of it all is just so, so good. Long sleeves, midi and maxi hems, luxe fabrics. What’s not to love, really? 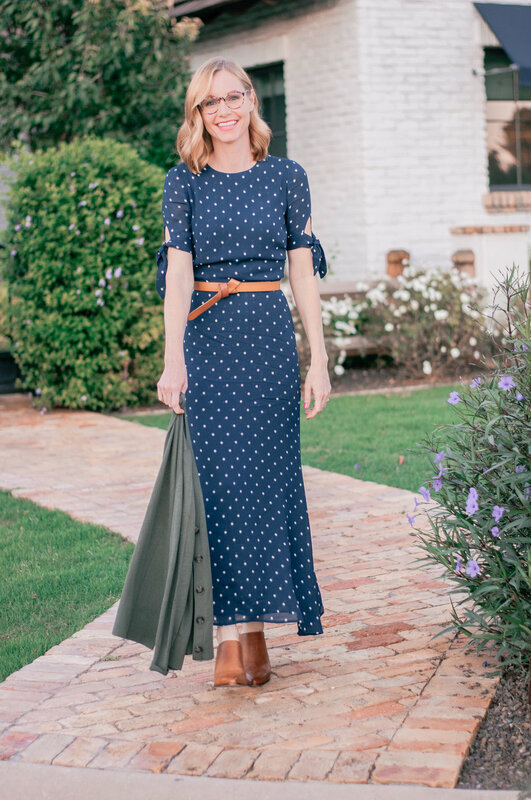 And it’s in that spirit and with those guiding principles that I bring you today’s post all about my very favorite Fall dresses! As you guys probably know by now, I don’t wear dresses very often in my day to day. Don’t get me wrong, I love a great dress and they’re such an easy throw-on-and-go garment, but I also just really, really love my denim. A lot. And I like to be able to move around and cover up (I’m admittedly not super comfortable showing a lot of skin. Never have been, never will be), so an easy, breezy ensemble that involves my favorite pair of jeans will usually trump a dress when I reach into my closet. That said, Fall is the season you’ll catch me in a dress in the most. 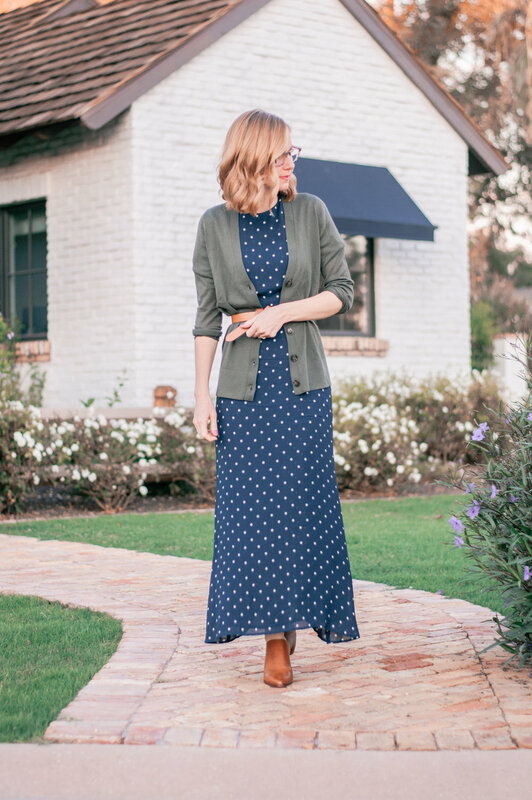 Like I mentioned the season in general lends itself to the kinds of dress styles I gravitate toward - sleeves of some sort, perfect for layering, midi hems and easy to pair with booties. Which is why when I saw this little polkadot midi/maxi dress, it was serious love at first sight. True dress love! 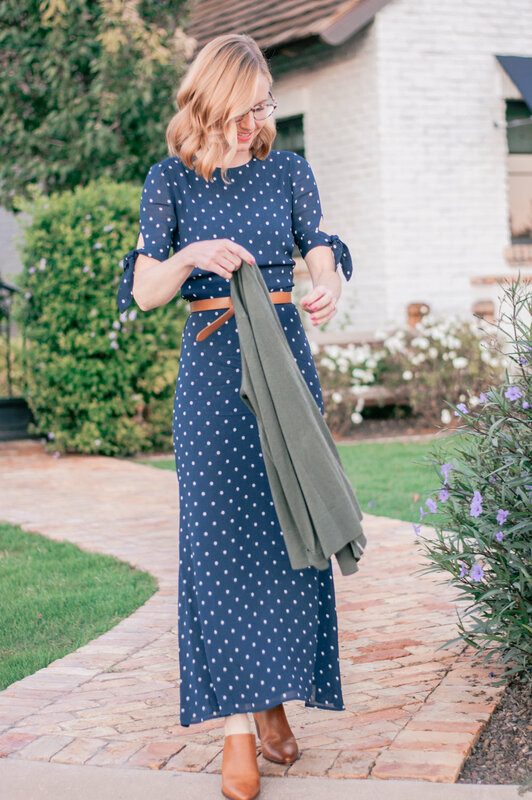 I’ve long loved Reformation dresses when I’ve seen them on other people and on the web, but had just never taken the leap. But our Nordstrom store here in Phoenix (Scottsdale) recently added an entire Reformation section and once I saw them in the flesh, I was even more smitten. Their cuts and tailoring are on another level and absolutely impeccable, and the prints and colors are just gorgeous. Their dress styles are also really versatile, so they’d work as well for a wedding as they would at the office or totally dressed down for casual weekend wear. Which of course, I appreciate. When I walked into the store and gazed upon this particular polkadot beauty, I hightailed it to the dressing room just hoping it wouldn’t crush all my Fall dress dreams and look completely ridiculous on me. Which was totally possible! I’ve had my dress dreams crushed before. Luckily, the fit was awesome and Ioved just about every single detail. Sold! 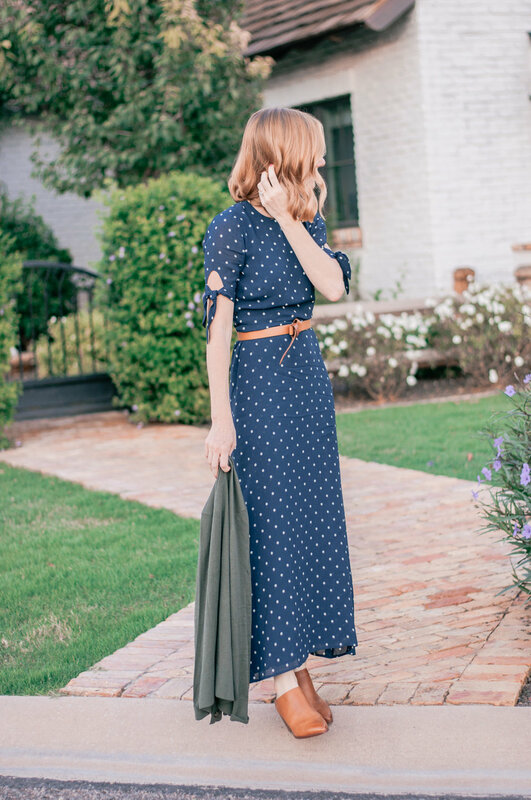 I think it’s probably important to give a little sizing insight here if any of you are thinking about diving into a Reformation dress… which I highly recommend now! I typically wear a size 0 in most dresses, but am wearing a 2 here and it has a pretty snug fit. Which my lovely Nordy’s helper informed me is standard for Reformation dresses -- they’re meant to fit like a glove. Not too tight, but snug in all the right places without any blousing, hanging and flowing so beautifully and fluidly. 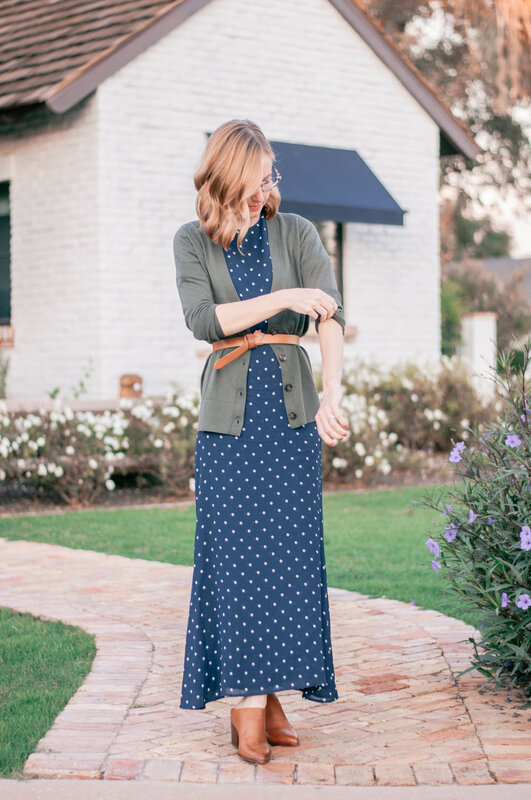 I totally contemplated throwing a brown suede or brown leather moto jacket like this one over this dress and probably will next time, but for some reason I’ve really been feeling the navy/forest green combo this Fall and the smart look of a cardigan paired with a dress and leather accents. I wasn’t sure it I was sold on the cardigan as much as I was on the brown suede jacket, but I decided to give it a go and couldn’t be happier that I did! Not only is it just downright comfortable and cozy, it’s a little bit more casual and relaxed, which I really love. 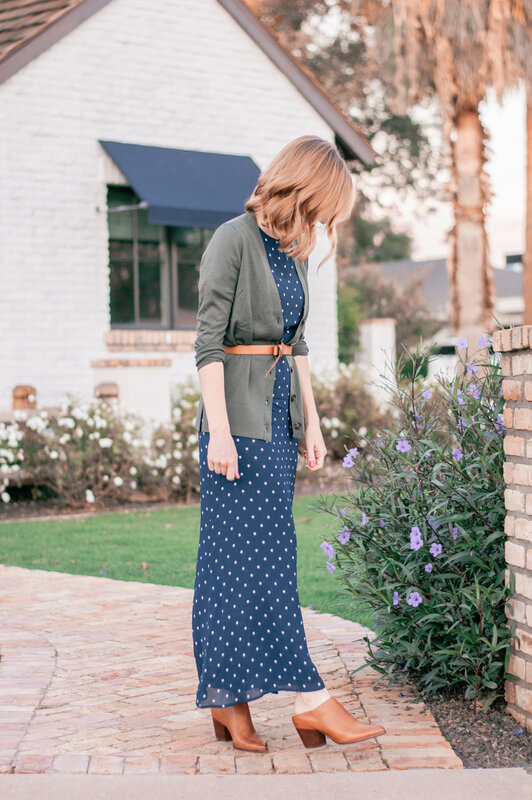 A cardigan be a little bit too casual for layering over a dress for a wedding guest ensemble (though I’m totally down for it, if you are), but at the office or basically any other occasion, I’m all about it! In addition to this one, there are some serious Fall dress stunners out there that I’ve had my eye on this year, including this gorgeous (and affordable) long-sleeved satin Burgundy midi, this fun and Fall-ready ditsy floral printed midi, this long-sleeved cobalt blue wrap midi, this amazing (and amazingly budget-friendly) floral collared midi, this perfectly peach embroidered frilly midi, this tie-front teal jacquard stunner, this vintage-esque long-sleeved midi with purple floral print, this oh-so-cozy blush pink wrap midi, and this perfect cap sleeve Reformation midi. Midis midis midis. Clearly I’m obsessed with a midi and ankle length style, and I’m not even a little bit afraid to say it! So flattering, so easy to wear and so appropriate for so many different occasions. OK guys so now you know all about my complicated relationship with dresses and why I think that Fall is just the best season ever to find and rock the same dress 765 different ways! Seriously… one dress can take you so many places this season and I just love every second of it. Especially when the dress in question is this awesome. But I’m dying to know… what are your biggest dress hangups? What do you wish you saw more of out there in dress land? And what dress styles do you absolutely love and feel so good in? Drop me a comment in the comments section and tell em all about your relationship to dresses. These are the things I need to know about you guys!